In the Mood, is a big band classic from Glen Miller & his Orchestra. This song topped the charts for 13 weeks in 1940. I remember playing my Mom’s 33 1/3 albums on the console record player when I was young. That is when I first heard big band music, of Glen Miller, and Tommy Dorsey. We moved a lot back than so all those albums are now long gone, but I did not lose my appreciation for the sound of big brass. In college, in the 1960’s, I listened to one of my favorite albums by Blood Sweat & Tears, made all the more enjoyable by their use of brass instruments. I remember In The Mood resurfacing as a single released by Bette Midler in 1974. All through my musical life, probably from my Mom, I have enjoyed the music of Frank Sinatra. What especially appealed to me where his songs that featured big band brass His album Live at the Sands released 1966 and made into audio DVD in 2003, is still a favorite of mine today. However, my decision to paint In The Mood came from a different direction. My artworks have always provided me with entertainment, that is up to the point that I begin to tire of them. When that happens, and it always does, I than push to complete the work. My last artwork, I Will Always Love You, took forever to finish. That extra time needed to complete that work exhausted my want to use that same style for my next project. Finding a new direction started from a casual mention, in an art video series I was watching, of an old favorite artist of mine, Mondrian. 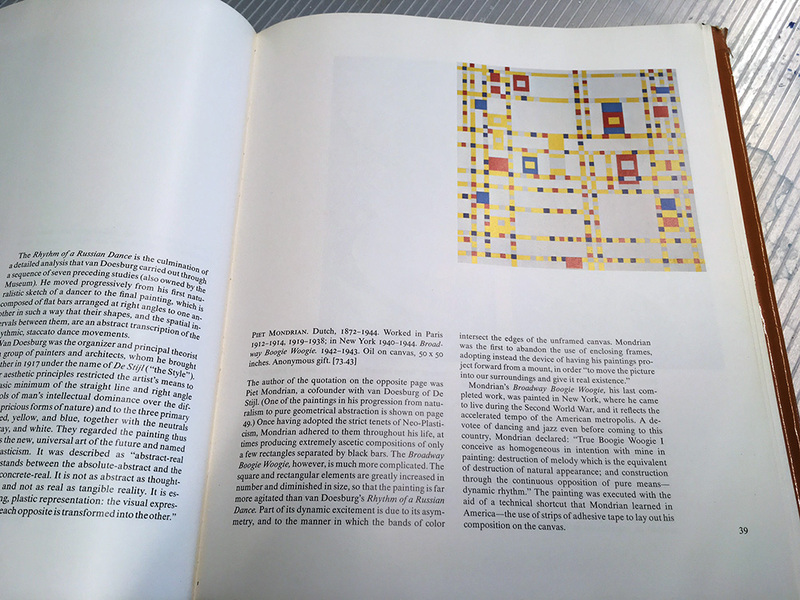 Thinking about Mondrian, I pulled from my bookshelf, one of my earliest art books: 125 Paintings from the Museum of Modern Art. 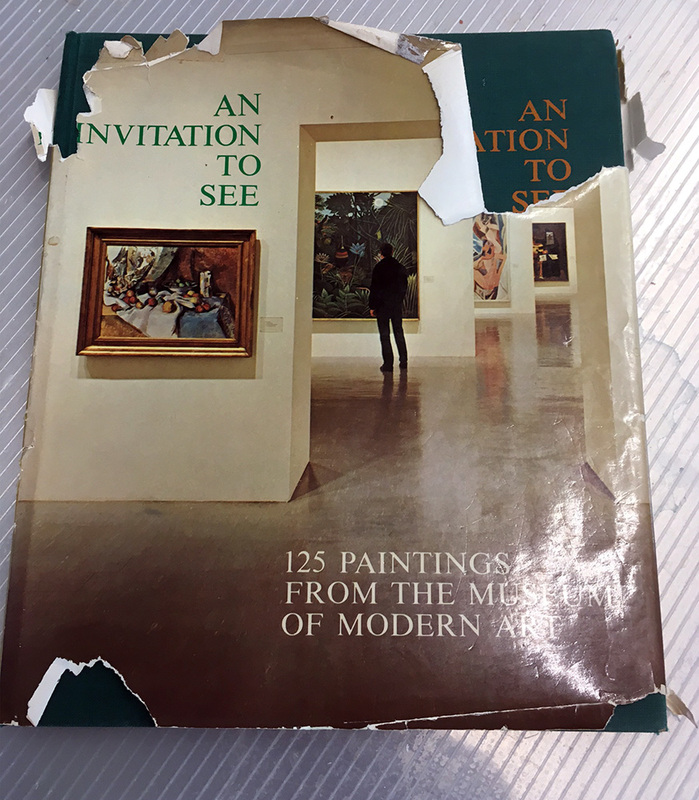 With the copyright year of 1973, that book was pivotal in the early development of my passion for art. That image than brought to mind my visit to the Museum of Modern Art, with my good friend Tom, where we explored all six floors of the museum in record time. I saw a lot of the paintings that day that I recalled from the book. I than checked the photos from that trip. To my surprise I had not taken a lot of pictures of the artworks, but there was an image of Broadway Boogie Woogie. No portrait with me, but that I took the photo confirms that on that day I had searched for it knowing it was a favorite from the art book. 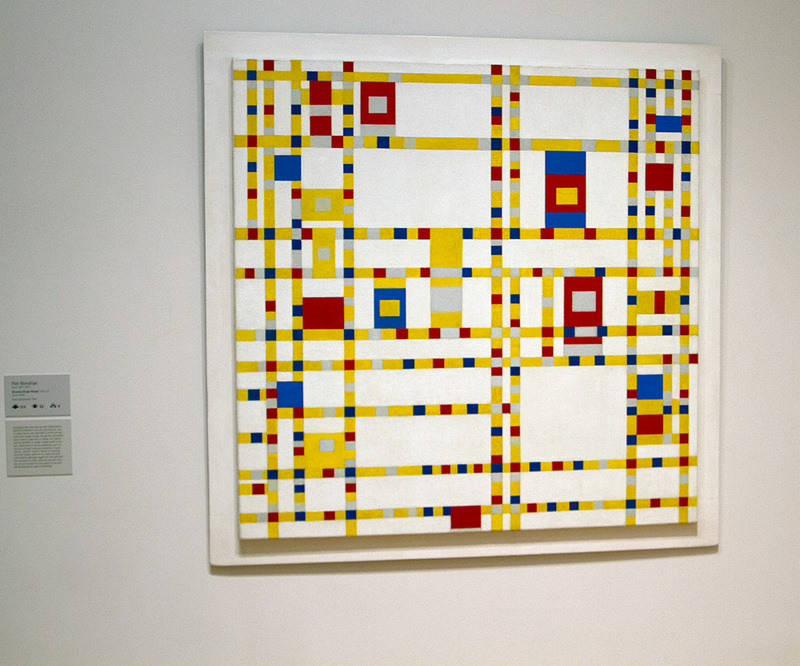 After the finishing of my last artwork, and knowing I needed a fresh approach, the Mondrian artwork offered possibilities. The title, Broadway Boogie Woogie, caught my curiosity so I search boogie woogie to learn about this music genre that originated in the 1920’s. It was not long after listening to a few examples that I came across one of the big boogie woogie hits, In The Mood. I now had my next art project of a long remembered song, with a fresh approach from a favorite painting from an old art book. ~ by Scott Von Holzen on 09/21/2017.